Every so often I like to attempt a challenge with a real risk of failure. 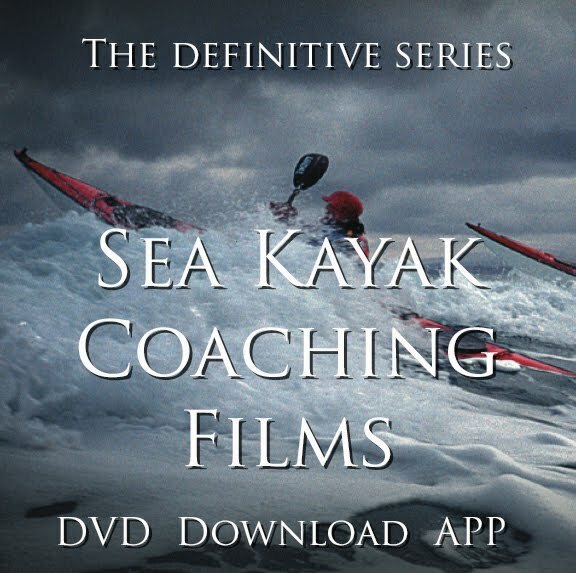 From walking the Pacific Crest Trail, to making kayaking DVDs, to cycling the Raid Pyrenean - in all of these I was absolutely uncertain as to whether or not I could finish. On Sunday I took on another challenge. 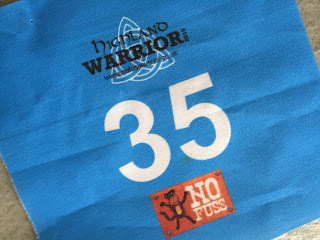 Now I have completed my first middle distance (half-ironman length) triathlon, The Highland Warrior organised by No Fuss Events. I planned to write myself a de-brief so I don't forget all the many point I learnt. Then I thought, "why not turn it into a blog post"? Someone, might find it useful. 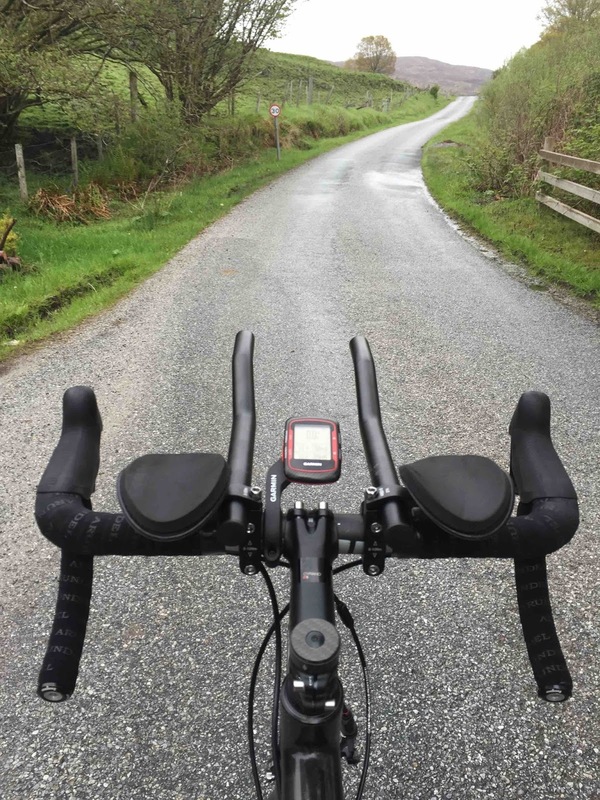 Better still, more knowledgeable, experienced triathletes might add their own thoughts in the comments below. So here goes. I was never going to set a winning time. I'm fifty six and, having missed a whole year of training due to a double hernia and repair surgery last September, I know I'm slow. I trained using a simple programe I found online. I knew my time to swim 2km in the pool, ride 56 miles and run a half marathon, so adding in the transition times I estimated a finish time of 6:30:00 to 6:45:00. I was 6:32:59. I was 21 out of 25 (Results), and third in my Male Senior Vet category (Cat results). OK, there were only three finishers in my age group and I was almost an hour behind the winner but as you'll read below, that wasn't the point. 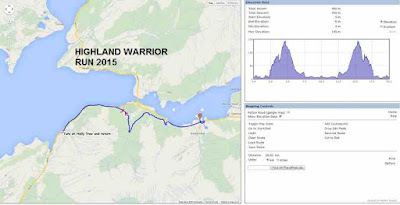 I entered this middle distance event because it is local, friendly and small scale. Even so, I left it to the very last minute to enter because I was fairly sure I would not complete it. It was only the encouragement of Sean McFarlane, with whom I did some filming at the Celtman, which made me think "yeah, why not". I also learnt a valuable lesson from an interview we recorded with another Celtman competitor Keith Maclure. He was second out of the water last year and was asked if he'd be first this time, to which is reply was (paraphrased) "It depends on who turns up. I'll go as fast as I can and I'll be faster than I was last year, but if there are faster swimmers than me, then no I won't be first". That axiomatic reply is crucial to my level of competition. I have no control over who turns up. Initially, I had thought I'd enjoy the event "as long as I'm not last". Pondering Keith's comments the penny dropped - if everyone else who turns up is faster than me, then I will be last! Appreciating that this factor is out of my control proved very empowering. The previous day I had a high carb breakfast - a bigger bowl than normal of muesli and low-fat Greek yoghurt plus toast. Lunch was a cauliflower fritatta with more bread. Dinner was 80g simple white pasta with a tomato and pepper sauce, all home made. 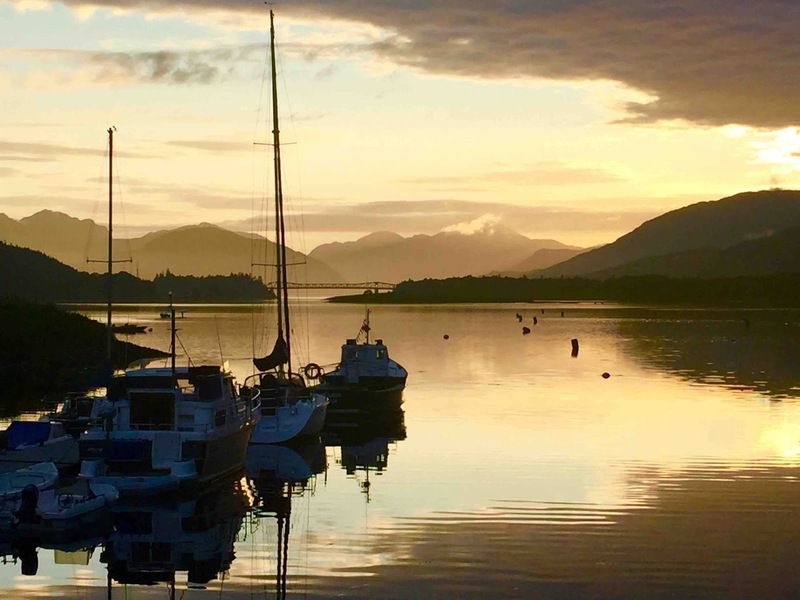 Despite being a local event, it started before Sunday's Corran ferry could get me to the race centre next to the Isles Of Glencoe Hotel, so I took the van to sleep in. 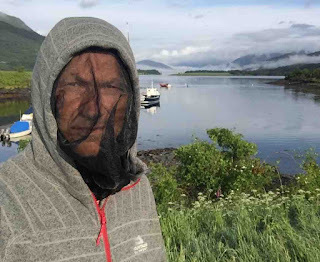 Midges were bad but I was asleep by 10:30pm. Breakfast at 5:30am was tea and some jumbo oats soaked overnight in almond milk, our standard 'take-away' breakfast. Having read about the need for extra carbs I crammed down 2 white rolls with honey but instantly regretted it. The nerves, adrenalin and extra food at that time of day made me feel sick - a feeling that lasted much of the day. NOTE - Try in training the Joel Friel idea (in Triathletes Training Bible) of a meal replacement drink to get in the extra carbs. What do you do? Comments please. I had planned to go back to sleep but the activity outside the van made it impossible. Midges were bad and here I made a huge mistake. So I could venture out and chat to the No Fuss Events team at registration I put Smidge repellant on my face. All day I had a disgusting, chemical taste in my mouth that threatened to cause me to vomit. I later realised my sweat was causing the Smidge to run into my mouth. As a repellant it's great. As a health supplement it's boggin. I should have just worn the headnet I keep in the van. NOTE - be careful what you put on your skin, including sunscreen, if it can run into your mouth. I was surprised at the range of equipment and, more importantly, the way it was set out for transition. Some people used boxes full of stuff while others had the bare minimum on the ground and on their bikes. My set-up with a box covered by a Ikea bag was appropriate given the kit I was using and the fact rain was forecast. I didn't have Trishorts with a decent pad, so I had to add cycle shorts over the top and use a cycle shirt. At T2 the shirt had to come off so the bib shorts could come off, and then the shirt had to go back on - a waste of time. Also, the tight short sleeves of a cycle shirt aren't comfy for running as they rub slightly. Before starting I was pleased the shirt had three rear pockets so I could take a gillet and arm warmers. In the end I didn't need them and I carried my nutrition on the bike, so perhaps the pockets are not essential - I'm still thinking this through. NOTE - Get some good Tri shorts with a decent pad and a cut-off sleeve Tri top, and it would be good if it had decent rear pockets. I had both a good swim and a bad swim. I was last out of the water yet I was pleased with my effort and with what I learnt. It was a floating start, not a dash into the water. While we were bobbing around, trying to warm up, I was unaware that most of the field had moved away from me towards the starting buoy. I was too consumed with trying to warm my hands. So when the starter yelled "Go", I turned to find the nearest swimmer already 30 yards away. I'm delighted that, despite the cold, I didn't panic and try to swim too fast to catch the field. That would have taken me into the red and I'd have gulped salt water into my stomach, which was already a churning mass of Smidge and porridge. Instead I concentrated on my stroke and relaxed. Although last I rarely felt out of touch. My biggest problem was sighting. 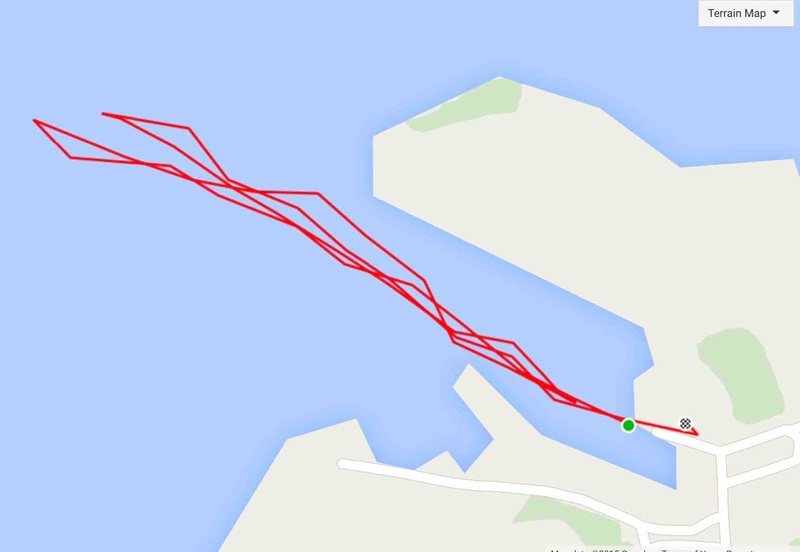 Take a look at my GPS track and you'd think I was drunk! This seemed to happen when I tried to forget about the race and concentrate on my form, using the techniques we were taught at Club La Santa last year. I need to work on this because I wasted time and effort going off course. In the pool I take 45mins to swim 2km (yes, I know that's slow - I'm working on it). So 43:33 was a good time for the open water, especially with my meanderings. 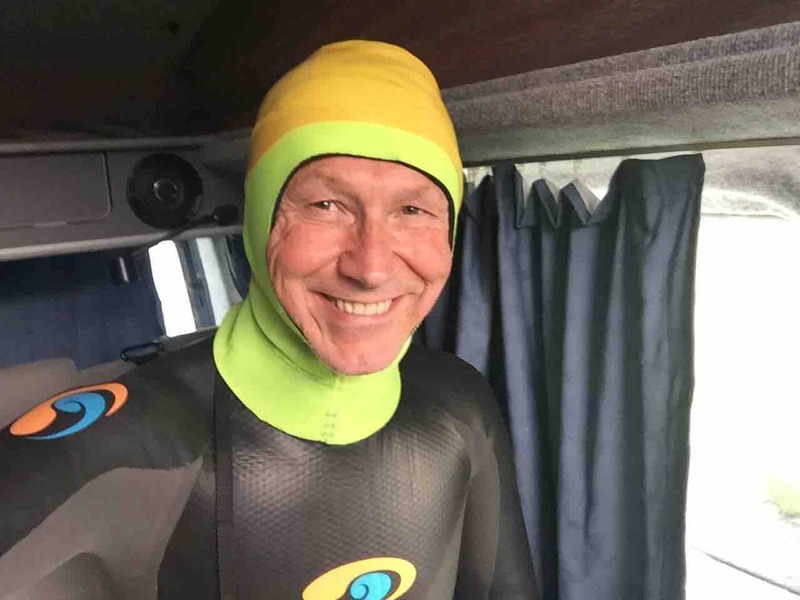 Water temperature was barely 10C so I had taken Sean McFarlane's advice and wore a 3mm neoprene vest and shorts under my regular Blue Seventy Reaction wetsuit, plus booties. Gloves were not permitted or I'd have had them too. Instead of a swim cap I wore a full head hood because I find this stops the cold water hitting my neck and taking my breath away. Plus because it's fluorescent yellow it can be seen when Liz and I swim in our local Loch Sunart. I must carefully position the goggles or the hood lifts them from my face and they leak. 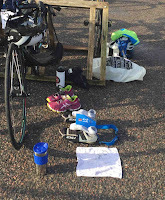 There were just two people in transition when I exited the swim and, partly because I had lots of neoprene to peel off, I was last to start the bike. NOTE: Wear less in the swim and T1 will be faster. Can you do without booties? Work on kick and especially sighting. This was always going to be my strongest discipline. I have a lovely, light road bike (way too good for me!) and it wasn't long before I passed the two people who had been in transition when I arrived. I would stay ahead of them for the rest of the race. 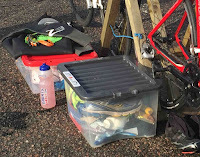 I'd been told to think of the bike as a 'rolling buffet', the place to eat and drink ahead of the run. 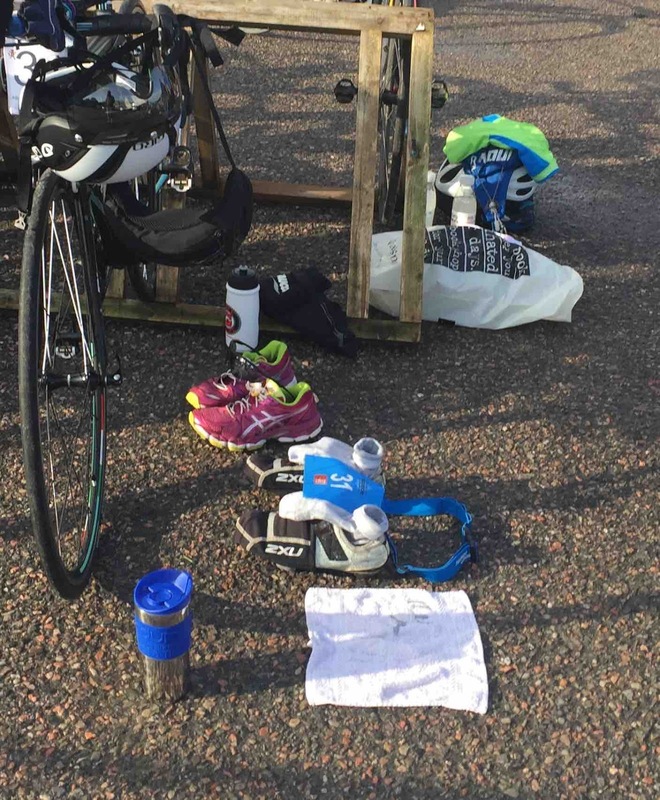 I planned to drink 1x 750ml of GoEnergy and 1x 750ml of Go Electrolite, plus eat a Mule bar and a gel on each of the three laps of Loch Leven with one final gel for the last push into T2. I had my Topeak feeding bag on the top tube of the bike, stacked from the bottom; gel, gel, bar, gel, bar, gel bar. I normally carry food in my rear pockets so I had to quickly learn how to use this. I'd open a bar, put the wrapper in a rear pocket, then eat the bar in small pieces. Normally I'll wolf these down, but my churning stomach refused to handle anything larger than a tiny mouthful. Half way around the lap I'd take a gel. On balance this worked well, and my stomach tolerated the gels better than the bars. I think it helped that I had a range of different gels (High 5, SiS and CNP) some of which were isotonic. On a longer race I would need a bigger bag. While cycling the Raid Pyrenean I had appreciated the 'real food' we'd stop to eat. With this in mind I loaded one pocket with a white roll and honey. Ugh - mistake. There was no way I could get that down. 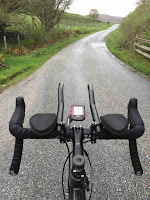 This was the first time I had used clip-on tri bars in anger and they were excellent. I'd bought the cheapest, well-reviewed pair on Wiggle and had taken time to practice and tweak the set-up. They really do work. T2 was slightly convoluted as I had to remove my shirt, remove the bib front cycling shorts I was wearing over my running shorts, then put the shirt on again - not easy in a rush. I grabbed my running belt with race number and loaded with 4 gels, plus 2 gels I'd taken from registration, plus a small bag of jelly babies. Initially all went well. Then just over 1 mile I felt a tingling in my legs which, ever since I was a kid, has warned me they were about to cramp. Sure enough it came. A lump the size of a golf ball on the back of my thigh. Worse still was the threatened cramp above each knee at the end of my quads (Vastus Medialis) - if those cramped I wouldn't be able to stand, let alone run. I stopped, stretched, considered quitting, but pressed on slowly. As the hill climbed my pace dropped from 9:30 to 10:30 and lower. It never fully recovered. In the 2:17:59 of the run I went through four gels and three cups of High5 drink at each of the 3 aid stations. The chemical taste from the Smidge was worse than ever and once I had a mini-vomit moment but the jelly babies were good for the return stretch. On the return I kept leapfrogging a guy who repeatedly stopped to stretch out cramp but eventually pulled away. The people running the aid stations were cheery and helpful - thank you to all the marshals for giving of their time. 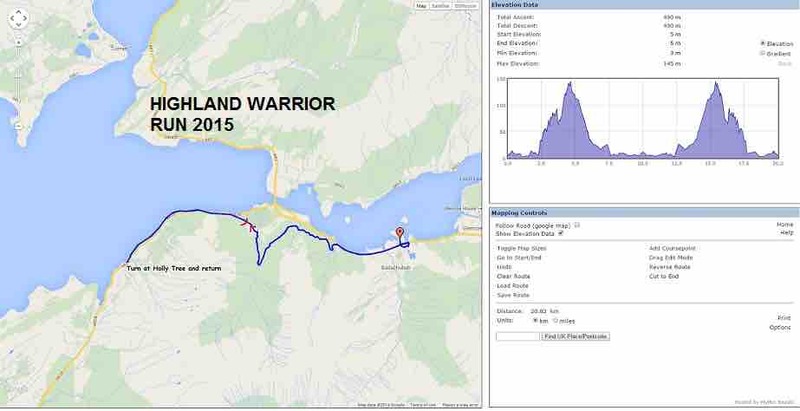 My disappointment came when I realised the run was going to be just over 12 miles, not a full half-marathon 13 miles. 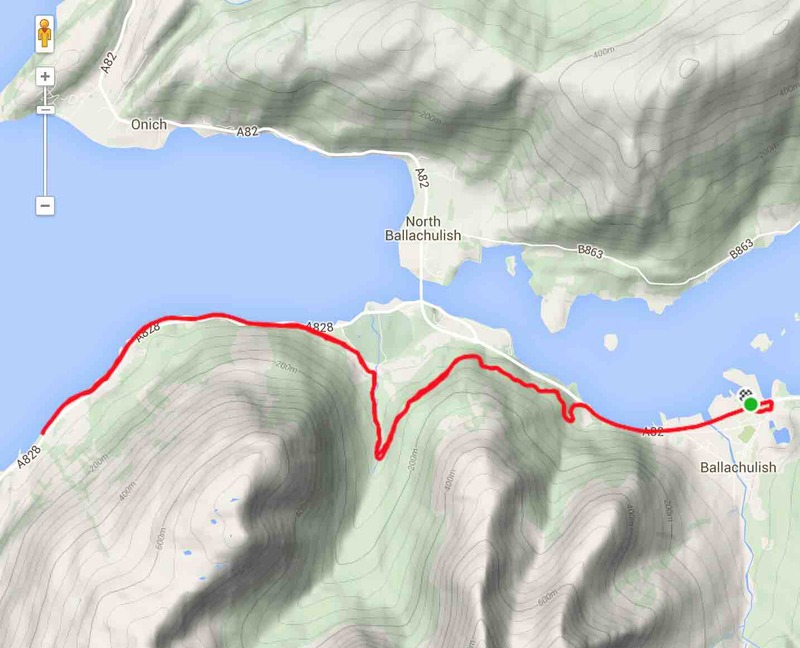 I had entered a Strava challenge to run a half-marathon and would be one mile short! I briefly considered the idea of running another mile. Very briefly. So then it was all over. I came in with just two runners behind me yet completely satisfied by my efforts and determined to do another middle distance event and try to improve on my time. I had a Goodness Shakes recovery drink waiting in the van fridge and, after changing out of my sweaty kit, I quickly drove home where Liz had a hot bath waiting. Everyone says an ice bath is best for recovery so I looked into this. The research shows that either a hot or a cold bath will improve blood flow to the legs and help recovery, with the ice bath offering a marginal gain over the hot. If you're competing at the elite level then this marginal gain could make all the difference, but not for the likes of me. A good meal of roast veg started to replace the calories expended. A rub down with some Aloe Relax Gel we brought homes from Lanzarote and some gentle rolling on a massage ball helped ease my legs. The following day I was slightly sore but not too stiff and could take the dogs on a four-mile walk. All in all, this post-race regime worked well and I'll do it again. Will I do it again? Yes, I've entered an Ironman 70.3 in September. Training starts now. Well, after a good massage and feed. After reading this, if you're thinking "he knows nothing!" then you're right! Please educate me. Add your wisdom in the comments below and please check back, because I will respond, probably with questions of my own.